The spectre of “Enforced Disappearances” is looming large on the Sri Lankan horizon again! The recent disappearance and reappearance of leftist political activists Premakumar Gunaratnam and Dimuthu Attygalle have very effectively beamed the spotlight on this curse both nationally and internationally. The abduction and release of Gunaratnam and Attygalle are not acts perpetrated in isolation. They are part of a new pattern of disappearances that are evolving. There were 14 incidents in February and 15 in March. Of these 19 were reported during February 27th to March 23rd when the 19th session of the UN Human Rights Council was on in Geneva. 16 of the 29 incidents occurred in the Colombo district and 8 in Jaffna district. Unlike the previous season of disappearances five years ago where most victims were Tamils the current phenomenon reveals a mixed bag of victims. There are reportedly Businessmen, Politicians, relatives of politicians, political activists,university students, schoolgirls, rehabilitated ex-LTTE cadres, suspected members of the underworld, and even members of the indigenous Veddah community. It appears that the disappearances phenomenon are on the rise displaying signs of escalating into an epidemic if appropriate action is not under taken. Against this backdrop I thought of reproducing an article I wrote five years ago to focus greater attention towards this vexed issue. This article written in April 2007 outlined the evolution and growth of enforced disappearances. This was at a time when Tamils were the primary targets of white vans. The enforced disappearances phenomenon is but one in a long list of problems plaguing the Tamil people of Sri Lanka in recent times. People suddenly disappear or go missing .There have been some incidents where Muslims and Sinhala people have gone “missing” too but the overwhelming cases of “Missing” or “Disappearances” pertain to the Tamil people alone. Though these incidents are loosely called “disappearances” they are really “involuntary disappearances” or “enforced disappearances”. Disappearances are nothing new to this Country. The Janatha Vimukthi Peramuna (JVP) insurgencies of 1971 and 1988 – 89 saw thousands of people mainly youths being killed or made to disappear. Officially sanctioned unofficial abductions and executions were the order of the day. While this method was consciously adopted by the state to defeat the insurrection the JVP rebels themselves were responsible for several killings and disappearances. Quantitatively state repression was much more than the JVP violence. Likewise the long years of an on – going ethnic conflict have also seen much Tiger terror, counter – terror, inter – terror, intra – terror and state terror. Tamil youths were taken , tortured and murdered in 1979 when Junius Richard Jayewardene declared emergency for Jaffna and sent his nephew “Bull” Weeratunga with orders ” to wipe out terror in all its forms” before Dec 31st. Similiar incidents as well as other types of “disappearances” took place frequently thereafter. There were many instances where disappearances and mass executions were part of deliberate state policy to quell the separatism. The Special Task Force in the East excelled at this type of counter – insurgency. In 1996 after the security forces took over Jaffna more than 500 Tamil youths disappeared. Some bodies were discovered at the Chemmany mass grave. While the security forces were responsible for many disappearances and executions of Tamils in the past the Tamil armed groups too were involved in such activity. The internecine warfare among Tamil guerilla organizations contributed greatly to this situation. There were also a lot of internal killings Moreover people suspected of being spies, informants and traitors were also victims. There were also instances of people being abducted for interrogation or for ransom. Many died in custody and are termed missing. In this endless cycle of ” misery” it has now become the turn of Tamils to bear the brunt of “enforced disappearances”. Disappearances have taken place in Colombo, Negombo, Dehiwela, Puttalam, Chilaw, Ratnapura, Avissawela, Wattala, Ratnapura and Kandy. They are also happening in Jaffna, Vavuniya, Mannar, Batticaloa, Trincomalee and Amparai districts. People are also being abducted in the areas controlled by the Liberation Tigers of Tamil Eelam (LTTE). A vague pattern can be discerned in the incidents occurring in the areas controlled by the Government of Sri Lanka (GOSL) . The disappeared and those reported dead can be divided into four broad categories. One category is that of people suspected to be linked directly to the LTTE. The second category is that of people suspected of being linked indirectly to the LTTE. The third category is that of businessmen suspected of being linked directly or indirectly to the LTTE. The fourth category is that of businessmen, professionals etc being abducted to extract huge sums of money as ransom. The current phase of disappearances and killings in Jaffna began as a calculated campaign to weed out and eradicate perceived LTTE elements. The ill – advised LTTE campaign of enlisting “trained civilians” as the so called “peoples force ” (Makkal padai) to attack the Police and security forces in GOSL controlled Jaffna made the state fully aware of the “enemy within”. The LTTE functioning officially as the “political wing” withdrew leaving the civilians to face the consequences. Many pro – tiger families also relocated to the Wanni. The danger of a “fifth column” was once again realised during the abortive tiger attempt to re- take Jaffna in August last year. As a result of this paranoia regarding a” fifth column within” people perceived as LTTE or LTTE supporters are being either killed or being abducted. Some of the abducted are interrogated and detained . They are regarded as “lucky” because their presence is acknowledged officially. Family members are informed and human rights organizations and some Non – Governmental organizations are also kept informed. A few have been produced in courts too.If anything happens to these prisoners or detenues the state will be held responsible and accountable. This extends some form of protection to them. But those affected terribly are those who have gone missing or reportedly disappeared. In many instances people are instantly killed or killed within a short time of being abducted. But there are many who have vanished without trace. Most of these “vanished” are reportedly dead. Some charred corpses have been discovered . In a few cases torsos of bodies have been found floating in the sea. It is suspected that abducted people are killed, body parts severed and then taken to sea and flung overboard with stones attached. It is widely alleged that the security intelligence and counter – intelligence operatives have assembled files of people believed to be linked to the LTTE or coopted into its service. Many of those killed instantaneously are people who are strongly suspected of being LTTE. Some killings however are by the tigers themselves of suspected collaborators and pro – Govt elements. In the case of business people suspected of being linked to the LTTE or helping them with money a different approach is adopted. They are asked to pay up and those obliging are left alone. But those refusing or not giving enough are killed. During the LTTE’s unbridled “occupation” of Jaffna after the ceasefire several public demonstrations were held. All of these were videoed by the security intelligence. Now those in the forefront of these demonstrations and those engaged in organizing them etc are being identified and killed. Students involved in demonstrations are also targetted. At the same time several people trained by the LTTE in combat or planted by the tigers as intelligence operatives are also being killed or abducted.. There is however a big margin of error in this. So many innocent persons are being victimised. In Jaffna elements linked to the Eelam Peoples Democratic Party (EPDP) are allegedly responsible for much of these acts. The EPDP has a public political face on the one hand. These political activists selling the “Thinamurasu” are unarmed and rely on Police and army protection to move about. The LTTE often kills these people ruthlessly. But there is another killer group of EPDP elements closely connected to Sri Lankan intelligence and security forces. It is this outfit which engages in abductions, extortion and killing. The EPDP along with some sections of the Peoples Liberation Organization of Tamil Eelam (PLOTE) were engaged in these activities in Vavuniya. In recent times the Karuna faction too has arrived in Vavuniya. With a senior LTTE leader from Vavuniya who was earlier in charge of tiger taxation joining the Karuna faction the situation transformed. Many who had given money to the LTTE earlier are being asked the exact amount by the Karuna faction. It is believed that the Karuna faction is a mix of several ex – cadres from different groups. Likewise the EPDP segment engaged in violence in Jaffna and Vaviniya are also a mixture of assorted elements. In Batticaloa the Karuna faction known as Tamil Makkal Viduthalaip Puligal (TMVP) is involved in abductions . killings and extortion in the form of taxes. The mainstream LTTE is also active in a clandestine manner. The TMVP has also opened branches in Trincomalee. Tamil traders are being taxed ruthlessly. Also Tamil community leaders and businessmen are being killed. The TMVP tried to move into Amparai district also. But opposition from MUslim people along with the hatred some sections of the STF have for Karuna has prevented this. So Amparai Tamils are not suffering like their counterparts in other areas in this respect. But they have many other problems. In Colombo the situation in the period after the ceasefire came into effect was one where the LTTE was killing suspected informants, para – militaries and members of alternative Tamil parties like the EPDP. Many Tamil businessmen were also compelled to pay money. The LTTE also infiltrated Colombo by planting its agents in different places. Some businesses were also opened by tiger stooges. Initially the abductions and disappearances were directed against the perceived LTTE fifth column. The EPDP was of help in assisting the intelligence. But soon the Karuna faction overshadowed the EPDP. In fairness to the EPDP it must be said that the party has a definite political program and was earlier reluctant to confront the tigers. But the LTTE forced the EPDP to join forces with the Security intelligence and collaborate actively in anti – tiger action. But the Karuna faction like the mainstream LTTE has no comprehensive political agenda. They are solely dependent on the state and are guided and controlled by the state’s “intelligence” handlers. In Mao Ze Dong’s parlance the TMVP cadres are nowadays the “running dogs” of (Sinhala) Imperialism. The Colombo scenario has started deteriorating. From a stage where only suspected LTTE agents were being targetted the situation has now become one where the profit motive is dominating. Most disappearances through abductions are now being enforced to extort massive sums of money as ransom. It is not only Tamils of North – Eastern origin who are being victimized but many Indian origin Tamils too. Some Muslims too have been terrorised. On another level people believed to be LTTE agents or intelligence operatives are also being targetted. Many of them vanish without trace and are believed to have been killed. Some bodies are found on roadsides, waterways. A few are headless. These bodies were meant to be discovered in order to terrorise the people. At the same time many are being disposed of in the sea. After the Chemmani and Suriakanda mass grave controvrsies there is reluctance to bury the victims. It is said that many victims are those killed by torture during interrogation. In many cases the ransom paid is so great that continuing with business becomes impossible. Some are forced to sell off property to collect ransom money. Also some who get released feel so insecure that they transfer their businesses to someone else and leave the country. There are also many businessmen who have run off to India, Singapore, Malaysia, Thailand, Middle – East and Western nations to escape being victimised. While these organized “disappearances for ransom” is overtly a racket milking Tamil cash cows there is also a hidden aspect. In July 1983 organized mobs consisting mainly of Sinhala – speaking hoodlums looted and destroyed Tamil businesses. Despite that blow the resilient Tamil people have bounced back and have carved out their niche once again in Sri Lankan commerce. What is happening now is another “silent” July 1983. The business concerns are not physically destroyed but Tamil businessmen are being systematically wiped out. Tamil owned or controlled commerce is rapidly eroding. The irony is that this slow strangulation is not being done by Sinhala mobs but by Tamil cat’spaws. The actual abductions are generally done by the Karuna or EPDP group or in a few cases by both. There is close collaboration by sections of the Police and armed forces and intelligence personnell. Some top “security” guy is usually at hand to help out if something goes wrong. It is also believed that a percentage of the ill – gained loot is given to these sections. In some instances the Tamil groups pay “bribes” to get things done. There does not seem to be institutionalised corruption or collaboration by the Police or Armed forces in this sordid activity. But there certainly seems to be collaboration on an individual basis by some sections of the Police and armed forces. Some victims have told families that their abductors simply flashed their ID cards at check points and got clearance. In some cases the abducted persons were gagged and bound and forced to lie down in the vehicle while their abductors placed their feet on them. The security personnel at checkposts were apparently not aware of abductees being in the vehicle. According to versions trotted out by released victims there seem to be safe houses in Colombo and suburbs where some victims have been taken. Others have been taken to makeshift camps in Polonnaruwa, Amparai and Vavuniya. Usually they are kept blindfolded and allowed time for meals and ablutions during which time blindfolds are removed. They were allowed to bathe once in two days. Some victims have been assaulted and badly treated while others were treated well. These vagaries were a result of the personality differences of the respective captors. Victims also say that their captors spoke in Sinhala, Tamil and English in different dialects. What is frightening about this racket is suspected connivance and condonement at very high levels. At least one cabinet minister has demanded and received money for the release of abducted persons. There are also instances of the families and relatives of abducted persons obtaining their releases through contacts at very, very high levels of Government. It is said that the only sure guarantee of getting one released is to gain the sympathy of family members of a powerful, political dynasty. This does not mean that a powerful “clique” is directing all operations. The abductors have autonomy in this. But if someone is to be easily released without paying up then political help at a very high level is absolutely essential. Against this backdrop the average Tamil victim does not trust the Police, armed forces or the Government. Those who have high level contacts use that influence to get their loved ones out. Others negotiate with the abductors, pay up and secure releases. After getting out most victims either leave the Country or simply keep quiet. There are however many who remain missing still. There may be a variety of reasons for this. In some instances the abducted do not have the resources to pay the ransom demanded. Some have not been released despite ransoms being paid. There is suspicion that many have been killed or died through torture in custody. The families of such people are despondent. The only silver lining in that dark cloud is the Civil monitoring Commission convened by Mano Ganeshan the Western Peoples Front leader and Parliamentarian. The chairman is veteran leftist and former Presidential candidate Siritunga Jayasuriya. Politicians such as Vasudeva Nanayakkara, Lakshman Kiriella ,Suresh Premachandran etc are also involved in the commissions activities. The efforts of this body have failed so far to get any “missing” person released but the awareness created has helped to minimise abductions to some extent. Currently disappearances in Colombo have decreased but are on the increase in the North. The role of agencies such as the Civil Monitoring Commission have been commendable in drawing attention to the crucial problem of disappearances. The CMC has played a pivotal role in creating public opinion on this. More importantly the Civil Monitoring Commission provides an avenue for affected families to complain without fear. The recent conference in Colombo attended by Ranil Wickremasinghe saw many loved ones of the disappeared release their pent up emotions in public. Ultimately the Government cannot shirk its responsibility. It is accountable for these disappearances even if it has no hand in this. But in Sri Lanka the evidence available shows that the Govt does not have clean hands in this. Many top persons are implicated. Statements by Govt personalities like “Tamils from the North are getting lost in Colombo”, ” eloping Tamils are missing” etc add insult to injury. Sri Lanka is only second to Iraq in the realm of disappearances. Yet International human rights organizations are yet to come out with comprehensive reports exposing the situation in detail. 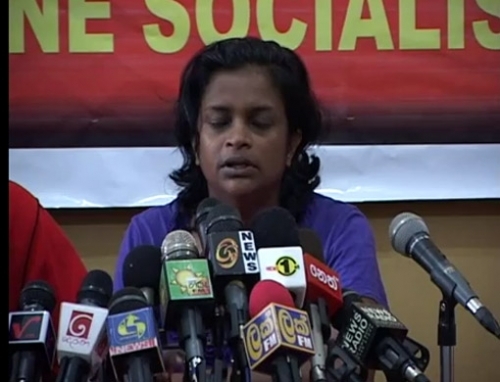 The Amnesty International exposed the Kumaratunga regime over disappearances in 1996. But last year more than a 1000 have disappeared. This year it has topped 300 already. The International community is yet to display the same energy shown over child soldiers in the case of disappearances. Terrorism is so bad and it is not always possible to be countered thro’ civilized arrests where all these procedures will come to apply for those rascals that can never be rehabilitated. Also, that sort of legitimate procedures alone cannot control a blood thirsty terrorists who are not guided by any sort of civilized rules. Terror needs to be ended by the same means, as a result terror supporters too get the same treatment to discourage others from becoming ones. To avoid this whole menace, ordinary people should not support terrorists unless they’re fully convinced and become terrorists by themselves who can first handed handle the counter-insurgency or deserve to deal with. In other words either you should become a terrorist or an anti-terrorist, so by doing so you can avoid being hit by a ‘wrong’ bullet. But if you stand in between, you will likely to get killed by both sides. Read later.THE Australian man abducted in Sri Lanka over the weekend has contradicted the claims of the Colombo government, claiming it abducted him, and were it not for Canberra’s intervention he would have faced certain death. Premakumar Gunaratnam, a 42-year-old Sri Lankan left wing politician who moved to Australia in 2006, held a press conference at his house in Sydney’s north this afternoon, after leaving Sri Lanka yesterday. He said that he was handcuffed, blindfolded and physically and sexually tortured during his three day detention. Advertisement: Story continues below “I have no doubt that if I didn’t have the Australian government’s support I would have been killed just like my brother and hundreds of other political activists and journalists have been killed,” Mr Gunaratnam said at his Dural home at about 2.30pm. His claims will put pressure on the Sri Lankan government, who at first said they were unaware of Mr Gunaratnam’s presence in their country, and once he was located stated categorically that they had played no role in his disappearance. “The Sri Lankan authorities never arrested that person,” the Sri Lankan High Commissioner in Canberra, Admiral Thisara Samarasinghe, told Fairfax media on Tuesday. He called on the international community to acknowledge what he says are ongoing human rights violations in Sri Lanka being commited by the govenrment of Mahinda Rajapaksa. “If everyone ignores the human rights violations in Sri Lanka then the Rajapaksa regime will continue the dictatorial regime abducting and killing people who speak out,” he said. Comment is being sought from the Sri Lankan government. You are right DBS. You predicted 4 years ago. When I read the article from the Age, tears flooded! It is a clear proof how the Government of Sri Lanka is value the freedom of speech, value the human rights. As a professional wanted to build the country from the War. planning to go back to my mother land . NOW I have to rethink. Until the cruel regime is changed there is no hope . Country run by Rowdy people from the south like Mervyn de silva, North Doulous Devananda and East Pillian and Karuna. What is the hope we are having in our country…..
Colombo fears a revolution in the South and insurgency in the North. The sword of Damocles hangs over the ruling family. One has to admire how the laws of the universe come to roost. “Enforced Disappearances” is part and parcel of Srilanka. After 30 years of end C=civil war and there are no more LTTE. But still “enforced disappearances” has not stopped. Maybe this what called “Vadake Vasantham”. The LTTE Devil has gone. But still there are some other devils. If LTTE did this then it will be classified as Terrorist activity. But If SL Goverment or our Hon. Douglas or Hon. Karuna does this – We can close our eyes. Because they are doing a “Developement”, they are building swimming pools, etc, etc. Only mighty GOD can save that nation. The “Enemy Within” — All those that the paranoid Defense Secretary thinks are threats to the national security state and or those his militias may make a quick buck from when they have nothing to do and are short of cash, tend to disappear – it is easier than due process! Clearly, Gotabaya Rajapakse the great defense Secretary (ha, ha, ha) is the biggest threat to human security, law and order in Lanka at this time – Long live the Geneva resolution! Mounting post-0war crimes need to be also included! You brought me to tears, DBS. Hope all gulity people would be held to account…. Sri Lankans do not understand that own supporters of the present administration is affected in the same manner. How foolish are the Sri Lankans. JVP caused mayhem in SL and it seriously affected the general public. Then GOVT “controled” it by “disappearing” some active members of it. General public closed one eye and approved it. Then LTTE caused mayhem. The GOVT did the job they used to do and again, the general public approved it by closing an eye. Are those disappear really innocent ones ??? Do you know Mr. Gunarathnam was held in Australian Embassy for some reason for any time before he went to the CID office. Whats the purpose of his earlier visits to Australian Embassy Sri Lanka while in Sri Lanka. He had visited the country 5 times. Why he had changed his real name to a fake name ( his birth certificate is a different name than his marriage certificate and thats different than his Sri Lankan passport and he went to Australia as a refugee and Applied his papers in a different name. Who is behind providing monetary assistance for his party? As far as we know there are PRO-LTTE and NGOs behind providing funds for him as well as the PARTY in Sri Lanka. Can you explain the reason for these two statements given at two different locations, by these two part members who went missing. Mrs Artygalle mentioned that, She was taken by 3 people who were wearing kaki suites and 2 civilians ( she suspects the 2 civilians to be JV members ) and then later mr Gunarathnam was there in custody along with her. But When Mr. Gunarathnam gave the statement he mentioned only he was detained and there were no other personal. So these two completely different stories and someone or both are lying at this situation. Their version of stories does not go together…as they planned. Do you think if Sri Lankan security personal wanted to come with uniforms to do such things… I do not think that they are that stupid?. This shows clearly someone is trying to show that there is a security force involvement by wearing uniform, and saying “sir” to one person. these are childish allegations. Also could you explain when Mr Gunarathnam went to the CID office who come the Australian authorities follow him in few minutes to the place. Another strange thing is when Mr Gunarathnam mentioned that his Austrilian passport was lost, CID requested Austrilian Authorities to issue a temporary travel documents. but all off a sudden Australian Ambassador handed over his original passport which he said was missing. Isnt it strange action. Who submitted his passport to the Embassy, When and Why??? Why he was lying about the passport as missing?? Also please let me know if a person in fear of the Government security forces as he mentioned why didn’t he go to Australian Embassy as a citizen of that country as the normal practice of any foreign citizen in trouble and pass 2 police stations and went to CID office. Who asked him to do that ? Lastly could explain his involvement with KILLING of 14 INDIAN Force members who were working in SRI LANKA. This is the main reason this person has changed his name, and escaped to Australia providing false documents to the Australian Authorities….its a serious violation of Australian Immigration process… Why Australian government is not taking any actions?? If the above theory can be prove wrong… i would love to put some evidence to this forum about his activities within this period which are very suspicious. Why dont you reveal yur true identity and designation and give us all the answers to which you have put some questions as a cosmetic device? Also please convey our regards to the Defence secretary. It is time for some inward reflection on the part of Ghotabaya Rajapakse, who ultimately along with the President know of, approve of, authorize, and sometimes instigate these abductions. It is not doing their cause any good, and in the last count, history will point to their culpability in the treachery against Sri Lanka that they are engaged in. I guess they think they can rewrite history, but that is only as far as they are alive. Later truth will surface and will tell all. Gotabaya Rajapaksa is the one who decides the crime and the punishment. People carrying out these crimes are directly functioning under his command. He operates death squads. 6th Battalion of the Gajaba Regiment is at his disposal and continue to commit crimes against humanity. Gajaba Regiment has become the Rajapaksa Para Military. Being a buddhist, I believe Gotabaya Rajapaksa will pay for his crimes. Eternal truth will prevail and Rajapaksa Criminals will be held responsible. Gunaratnam’s story is not very convincing.So is Atygalle’s. They keep changing from time to time. Gunaratnam said to the police that he was not tortured but treated well and once in Australia he not only changed that but also included sexual torture. Atygalle once said it was definitely a JVP job and changed that to a government job some times implying JVP and the government were together. She never claimed sexual abuse which Gunaratnam did which implies that who ever the abductors were they must be gay. Coming back to the story,If the authorities wanted to take him in,they did’nt have to resort to unlawful means to take him in the first place. This guy has murder wraps to his account on top of jailbreak. Now,with that kind of a record,it is understandable his desire to appear in an alias but to walk up to the CID and claim I am so and so is beyond belief. What is more bewildering is that the police instead of taking him to custody and charing him with all the felonys,escorts him to the airport providing transport and security. Power of “Austratian Passport”? or was some deal struck on? On the other hand had he managed to jump the country as Noel without getting the HC involved Gunaratnem would have dissappeared for good. One does not know what Gunaratnam exactly implies when he says he was sexually abused but it is not a charge that males make public because of the humiliation. In fact he prefaces the statement by saying he is “ashamed to say”. Male testicles are put in drawers and slammed;wires are tied and electricity is passed.rods are rammed through the backside. Chilly powder is rubbed in. So why do you assume the soldiers who sexually abused Gunaratnam were “gay”? He may be a rogue, terrorist, liar, impersonator or any other bad guy. But the point is when the whole world was accusing the Government for his abduction authorities just send him hurriedly out of the country, without investigating as to what happened, merely because Australia wants it. An investigation is important as this took place son after the Geneva episode. what Americans did in Iraq. But the so called Human Rights organizations not go behind the Americans. Why? Do the Americans and their agents(LTTE and UNP) have the inherant right to kidnap and kill people in Sri Lanka? I hope Australia has many “moles” against the current government of Sri lanka. Australia gives passports with different names to the criminals who are capable of making trouble in Sri Lanka. Dear DBJ, what is written here is cent oer cent correct. The regime is involved either directly or indirectly in kidnapping. If not, an elected Governemnt Should resign if they cant protect people. After all they were not elected by vota but by money.If the govt cannot protect cictizens what is the use of government. After all the people in Srilanka are still deep slumber and by the time they wake there will be no srilanka. People can write volumes of mahawamsa only for MR regimes corruption and thuggerism. KARUNA WAS GIVEN A FALSE NAME AND A NEW PASSPORT BY DEFENCE MINISTRY THEMSELVES NOW THEY ARE GIVING BIG TALKS ABOUT NOEL MUDALIGE HAVING TWO OR THREE PASSPORTS. WHERE WAS ISLAND AND SHAMINDRA FERDINANDEZ WHEN KARUNA AMMAN WHO KILLED 600 INNOCENT SINHALA BUDDHISTS WERE GIVEN FALSE PASSPORT AND THAT TOO VIP PASSPORT AND SENT TO UK?????????????????????????????. Thank you DBS for exposing these people. Had we have journalist like you living in the country not jokers like Shamindra ferdinandez of island – our country will be saved…. Just because the Australian Embassy had his passport, does not mean Gunaratnam was there. He is an opposition politician from the People’s Struggle Movement in Sri Lanka. Prior to his abduction he had received credible information that he was under intense surveillance by the Sri Lanka Government. As a safety precaution Mr. Gunaratnam gave his passport for safekeeping to his friends. When Gunaratnam was adducted , his Australian passport was given to the Australian Embassy. BTW none of his friends were expecting to see him alive. Thanks God for the Australian Government intervention !! Thanks DBS for writing this article not many Sri Lanka Media Outlets are brave enough to write about “White Van” Abductions ..
We faught the beast and killed it. And in doing so, we became the beast. The government could easily scrap this guy’s SL citizenship and declare him PNG, Persona Non Grata and that would eliminate his political aspirations in one swipe. They haven’t. I’m at a loss to understand why? Kumaran Guanarathnam is a terrorist who involved in attack on pallekale army camp on 1986-1987. JVP leader Somawansa amarasinghe has clearly mentioned in publicly that this new group consisted with tamil racist who lead by Kumar gunarathnam. There are so many faces to terrorists and we have destroyed just one of it. While fighting carders were involving in fighting, LTTE media group, Terror human right activist groups, Political group also involved in their seperatism course. The High commissioner who refrain from giving any information to Mr.Ghotabaya Rajapaksha, when he was asking for details about this terrorist, have given all the details to him after kumar’s missing. How top diplomatic agents play this kind of ugly games with a legitimate government? Let this raffish group to compete in election. I’m sure at that day people of Sri lanka will show to international community, with whom they are and also the destiny of conspirators and their international backers. Saying Gota is responsible for all the crimes and perceived crimes taken place is like holding R Premadasa accountable for all the crimes done by even JVP/LTTE those days… However Premadasa had his own accounts and met his fate in the Armour’s Street. Let’s see if Gota will have the same which I don’t think, touch wood..!! “We faught the beast and killed it. BTW how many people were punished for the Horrendous War Crimes in Sri Lanka ? all these morons only by becoming allergic to their presence in our systems. itself proves,they will only listen to SUPER POWERS. Now the same effect comes over to Sinhalese businessmen and to SLFP politicians as well. Buddhist priests murdered for treasure hunt. The popular Lankaenews which is the strongest anti GOSL campaigner in the West, has published the full CV of a White Van driver involved in the recent incident in Kolonnawa.. The alleged victim is the most notorious Kudu dealer there,, and according to Kolonnawa inhabitants, he is the the right hand man of the so called Kudu Duminda who was the number one enemy of the same Web News letter not long ago. Mr Kumar Gunaratnam alias Aussie Mudalige, is responsible for killing 14 IPKF members according to the” Hindu ” edition yesterday. And the Hindu is not happy about the GOSL handing him over to the Aussie Lady in the HC. The most significant aspect of these abductions and disappearances, is that there are no victims among political activists or members from the legit Opposition parties, like the UNP, JVP, and even the TNA. kalu,as i said once earlier,you are the only one who can make a fart smell nice.Keep it up. You are concerned that there are no victims from the opposition.There are!But mode of operandi is different. Ask Wimal and Johnston buddy.HONOURABLE VICTIMS! The fact that Gunaratnam had so many aliases and stayed out of lime light and operated like under cover CIA agent is enough to suspect him as a shady character and therefore a dangerous man. In my opinion, Gunaratnam should have been arrested for violating emigration rules that Aussis forced upon us, and as British implemented for Karuna Amman we should have dig into his past and fix him. Degrading and banish him from Sri Lanka for the sake of our country is ok but not enough. It is obvious that this breakaway group of JVPers is full of radical elements of extreme character that had already entrenched in to trade unions and student groups. We have seen them using western backing and funds through NGOs to disseminate lies, hate and untruth to disrupt peace in work places and universities. I see this lot as much more dangerous to our upcoming society than now down trodden Somahansa group. Beware! Westerners are waiting for à la Libya in Sri Lanka and they will use anyone to reach their goal. Just open the link below to see who is operating the white vans. The author has named the SL crime family or sorry, the ruling family. Oh God, I am gwtting mixed up, wait a minute, both are one and the same. No wonder it is hard to say. The 150 infiltrators in the N & E cannot do much damage by themselves, so their paymasters need a rebellion in the south to divert the attention of the military. Gunarathnam’s extraordinary rendition (oh yes, that’s the word used by those countries which preach to SL about ‘abductions’. Unfortunately this valuable tool in national security is being grossly misused for monetary gain and settling personal scores her) seems staged though. If the intelligence knew of his whereabouts why wait till the last minute to act and do it post-Geneva. This was just a publicity stunt to tarnish SLs image and begin the regime change project in earnest. This party will just be another three-wheeler party of the looney left like Pachabahu and Sirithunga, propped up by millions of dollars in funds but only a few thousand votes in an election. Now Noel is back in the safety of his mortgaged house in Sydney enjoying all the benefits of capitalism, whilst his followers will brainwash rural university students to sacrifice their lives for the socialist revolution. The reason I assumed them to be gay is because the woman claimed to be abducted never accused her abductors for sexual harrasment which normally should be the case, unless they are gay. I have never justified torture and I know it is against the law and international conventions.I only say is this guy can not be believed because he never made this allegation in the police station where the Aus HC was also present. He only made this Particular allegation after he reached Australia.You can not claim he didnt do this at the police station due to humiliation because when did make this cliam he did it in front of the whole world. In my opinion the whole episode is a mockery. Political ideologies are secondary to animal instincts. Many of the people abducted , example in Negombo was pure criminal thugs of tamil/muslim orgin…Which have plauged the city with there power, and escaping murder cases, asults, rapes, with money to the police. The guy in Negombo was called “feroz” Tamil muslim criminal. If the Government of Australia is not in related to this case, they should immediately check the false documents submitted by the said person when he acquire the Australian citizenship. We have checked the documents submitted and there are false documents in his visa application. ( you can check these in the immigration office and colombo high commission ) So many false documents. We also have credible information that he had received extensive fundings from LTTE groups and associations in Australia and Canada to tropple the government with such funds.